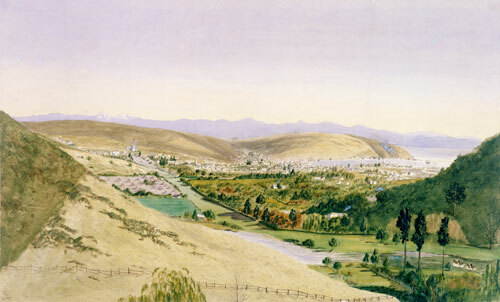 This watercolour by Francis Ann Fletcher presents a romanticised view of the agricultural hinterland of Nelson. New Zealand Company settlers had been promised 150 acres (61 hectares) of rural land, but there was a shortage of available land that could be easily cultivated. The hills around Nelson were much steeper and harder to work than this image suggests.